Jamey Aebersold Jazz Play-A-Long Volume 29 PDF + Mp3 CD download. 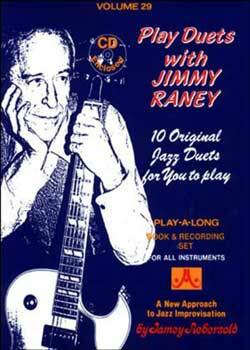 Play Duets With Jimmy Raney. Intermediate/Advanced. Now includes TAB parts in addition to “standard” music notation. All duets are written in C Concert with chord progressions transposed for Bb & Eb. Stereo separation al- lows you to switch off one channel and fill in the missing part. Melodies are written in duet form, followed by Jimmy comping on one channel and soloing on the other. Drummers and Bassists this is for you! There are no other instruments on the CD. Play with the CD in stereo, then separate the channels. Horn players will want to solo while Jimmy accompanies. 10 original tunes based on standard chord progressions in a variety of feels and time signatures. Jimmy’s improvised solos are available as a supplemental book. Download Jamey Aebersold – Jazz Play-A-Long Volume 29 PDF free and other books from our site. Only high quality PDF scans. Please write a review, it's important for our community.